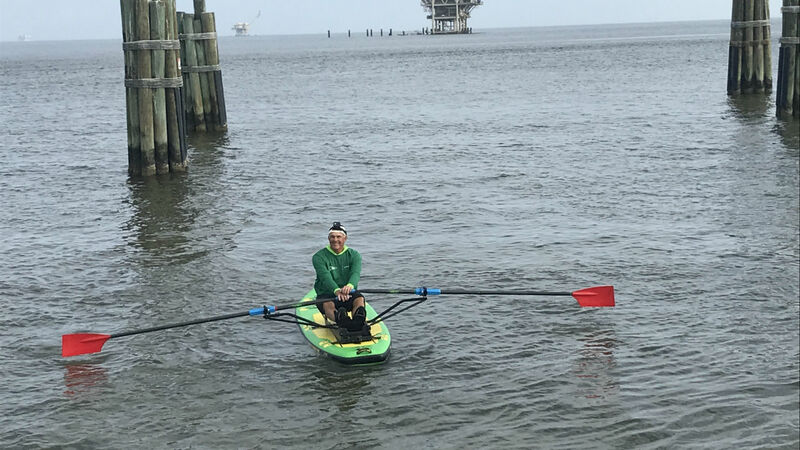 Can I row with my Dogs? Definitely. 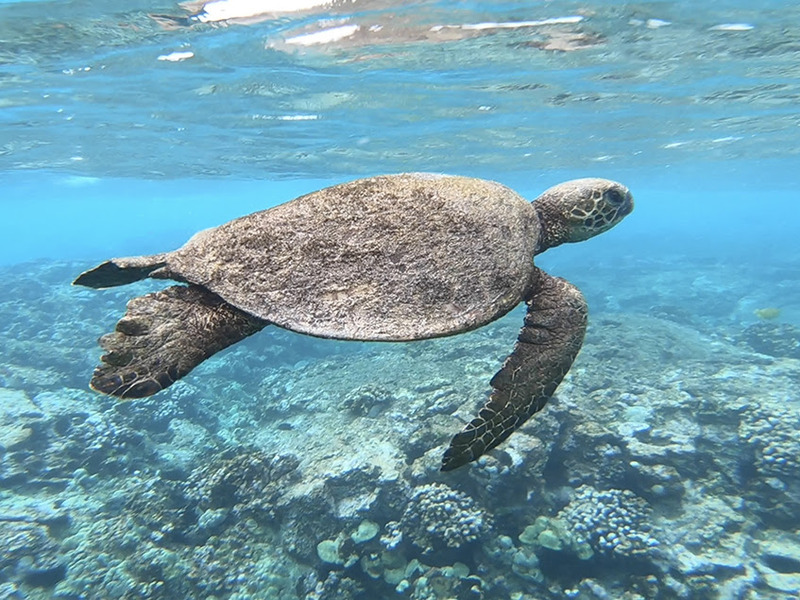 The surfaces of the inflatable Adventure Standup Paddleboards are fantastic for their feet. They won’t slide of unless they are goofing around. It is tons of fun. 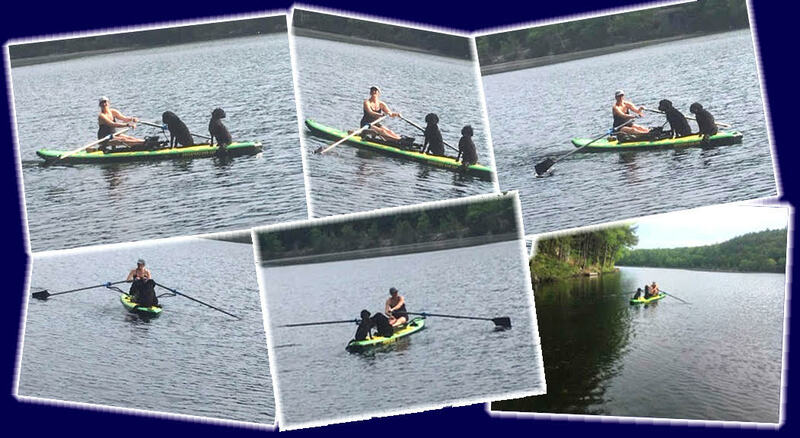 I have 2 Portuguese Water dogs, I say, “who wants to come?” and they jump right on and hang out while I row. Will I get a good work out? / What is the dog weight factor? My two dogs weigh 80 pounds together. 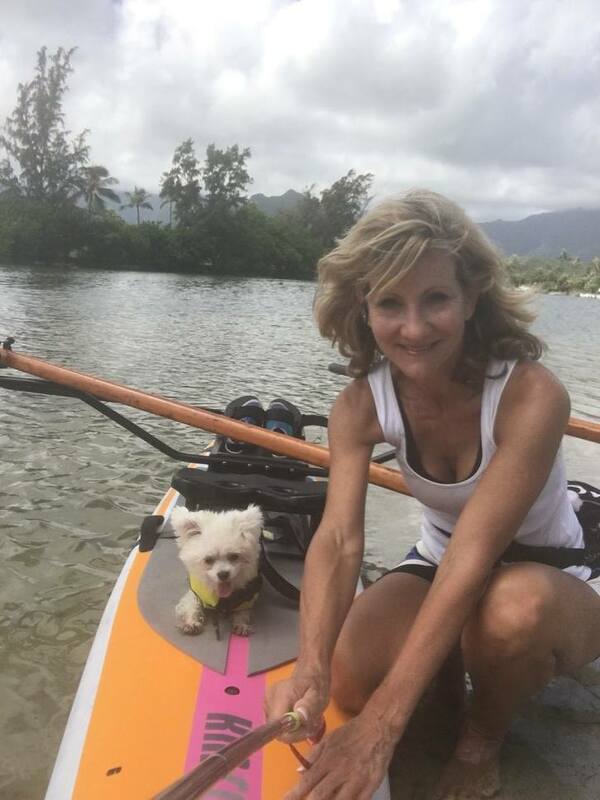 If you do the math – 2 arms rowing 3 creatures, 2 of whom are squirming, not using their core to balance and to move the boat, add a bit of wind – it’s work if you want to move far and fast. Sometimes I let the dogs jump off on an island in the middle of my lake and I take a spin around and I feel like I am flying – like I should be required to put a seat belt on. 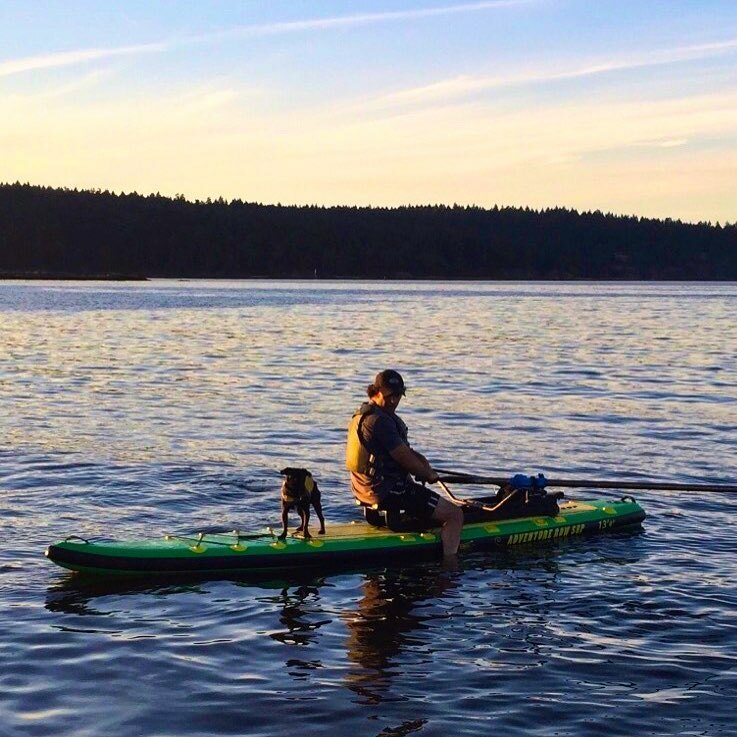 Is it hard to row with the dogs? If you are reading this, you are in love with your creature and want to bring pup with you absolutely everywhere. 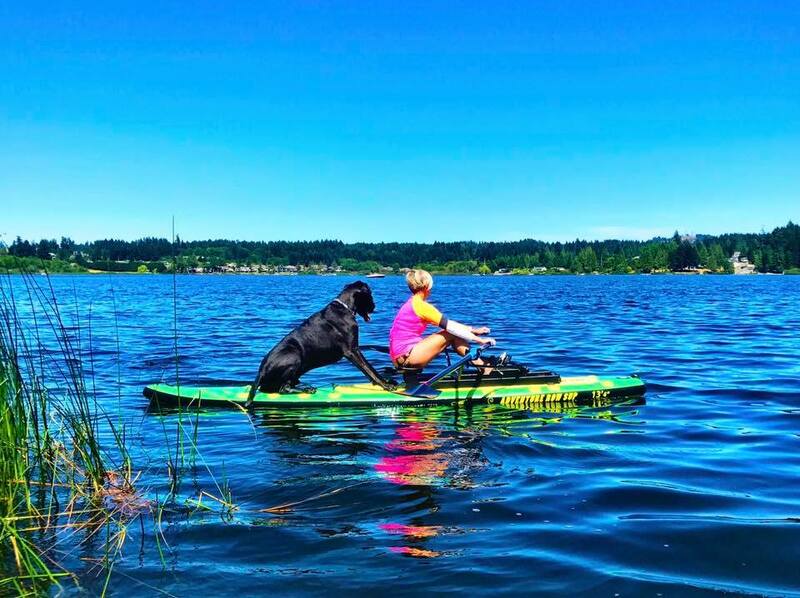 This is a totally inclusive way to get a work out with your pup, plus the joys of having them out on the water with you totally makes up for the extra effort. Are there any safety issues to be aware of? 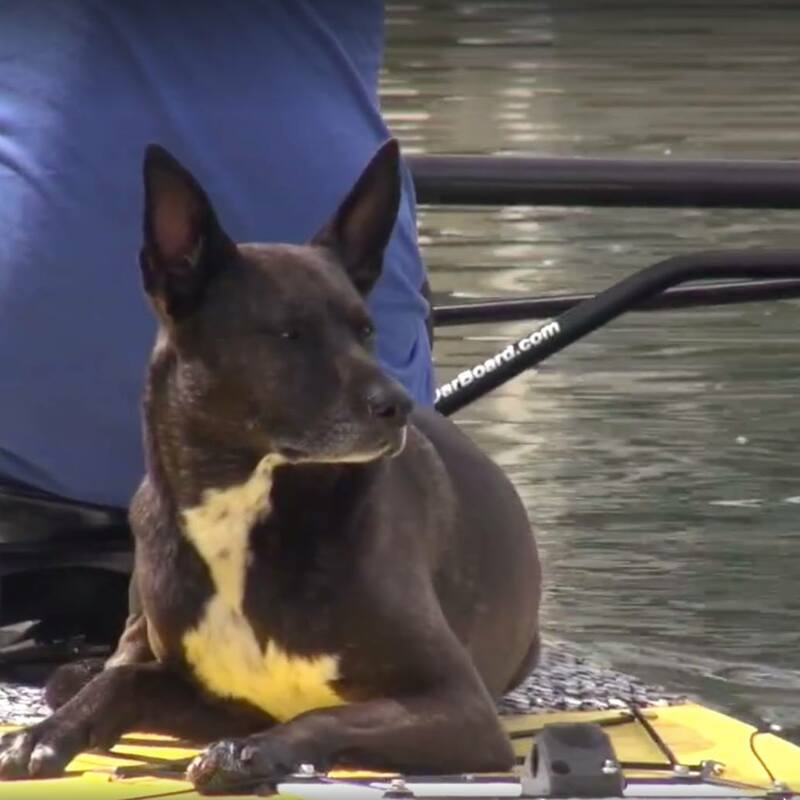 While rowing with your dogs is generally very safe there are a few things to watch out for. Keep an eye out for their paws as you slide forward, when my dogs are walking around, sometimes they step into the rig. Sudden turns can sometimes knock the dogs off, but dogs wise up pretty quickly. 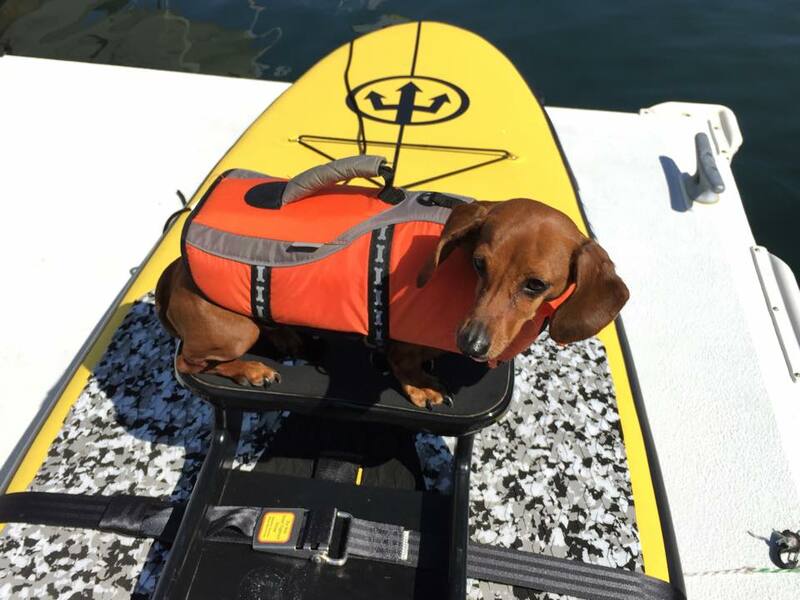 If your dog is not a water woof then best to have a life jacket on them. If your pup is wearing a jacket watch out for the jacket straps and pads while they walk around. How do I get my dog to sit in the middle of the boat? Not so easy. I am working on the command -”pups get to the center”. They are not listening very well just yet! My older dog knows the drill because we rowed together for a season before the stork delivered the puppy. It is harder to do with 2 dogs, but they work out where they are safe on the board pretty quickly. 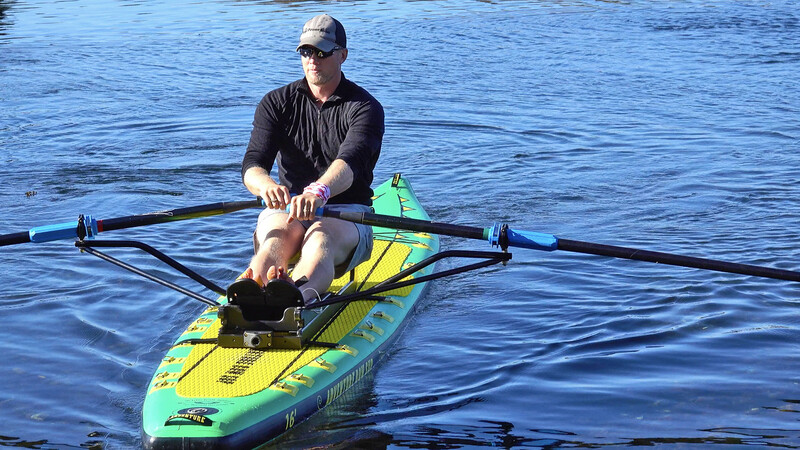 You can try putting both oars on the water and quickly alternate lifting each handle to rock the boat. Pups might then move toward the centerline for stability. What do I do about the paw/snout/tail drag? Nothing, consider it in the same category as wake or wind. My pup lies on the bow with a paw dragging in the water, sometimes he puts his snout in and lick the water as I row. They are out on the water to have fun just as much as you are! What do I do when my dog does ‘the dance’? Pull over. Pup has to pee. Absolutely practice both ahead of time with the dogs before you set out. 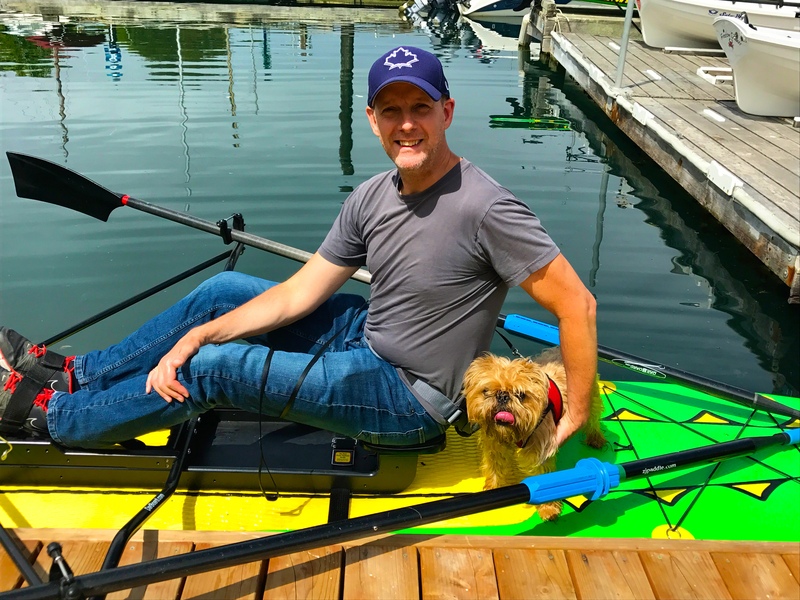 As the board with the oars out is quiet stable, getting the dog out of the water and onto the boat can be quiet easy (depending on the size of dog!). I take my feet out of the foot stretchers and crawl low and balanced toward the pup if he is trying to climb on to the stern. Bow boarding is easier, I twist around and pull them up, the pup then walks around me to the stern. Will pups paws hurt the surface of the board? No. 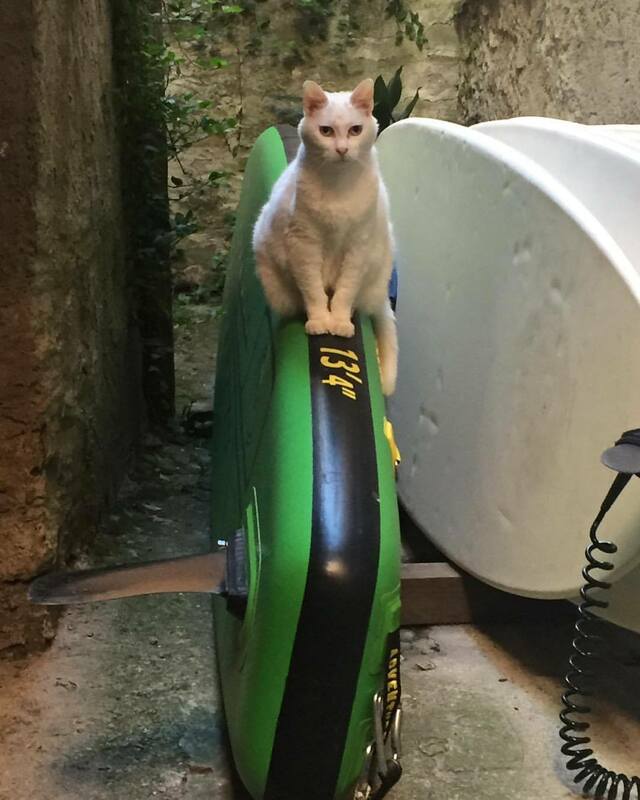 I was worried about this at first however the surface of my inflatable Adventure SUP is quite tough and the rubber coating on top would be difficult to poke with a claw or to bite. Do dogs make good Cox? Actually, yes! 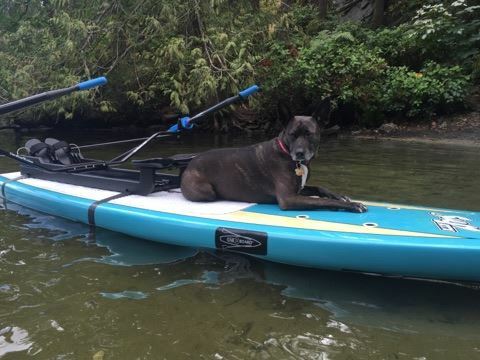 My 3yr old dog sits in the bow and gives me looks when I am near a boater, loon, or island. The puppy is terrible! He sits nose to the air and smells for bunnies or flying hamburgers. 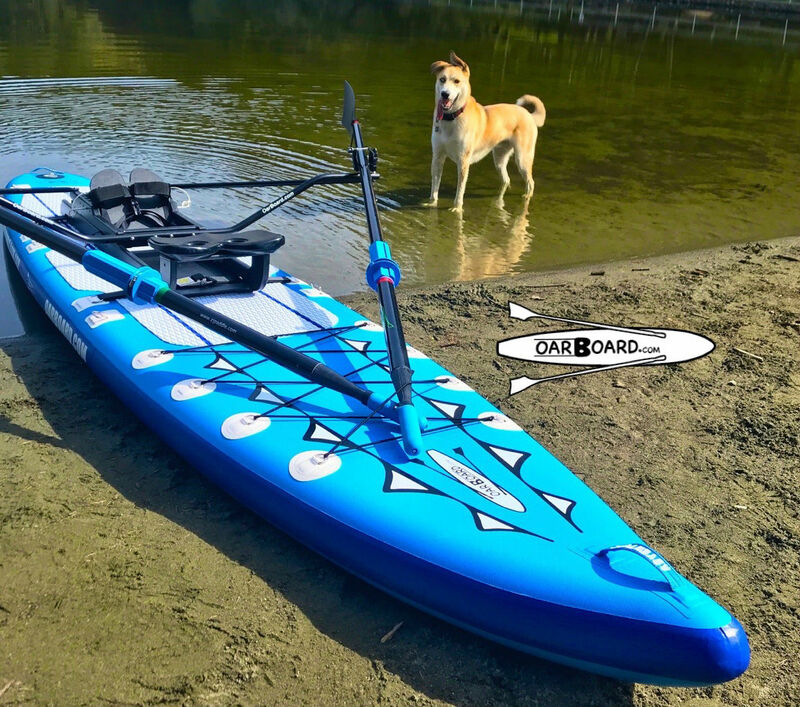 Will I get wet while on the Oar Board® with my dogs? Odds are yes. When they go overboard to chase a duck or to cool off and after you hoist the dog back on, they will shake and you get the spray! I have the adventure board so I am almost far away enough from the pup to avoid the worst of the splashes. 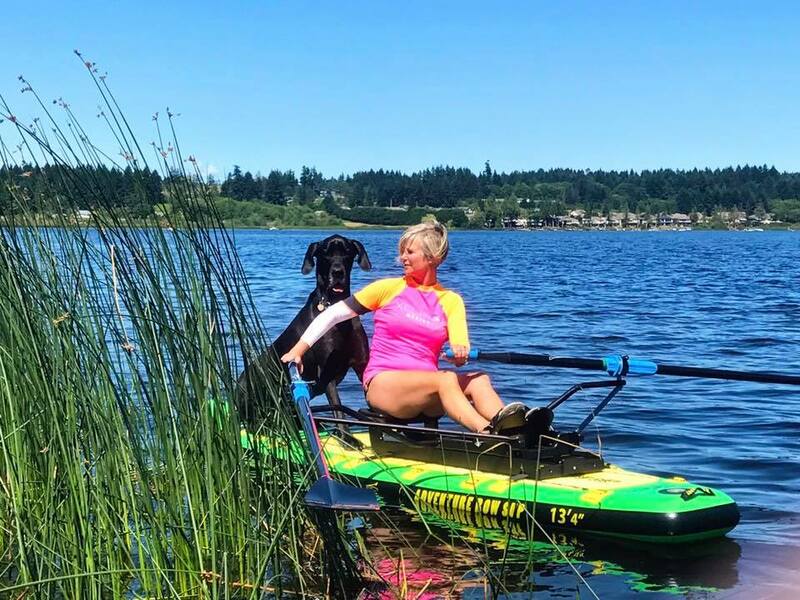 Thanks to Oar Board Ambassador Wendy Traynor for answering these FAQs based on her real life experience of rowing with her two Portuguese Water Dogs. 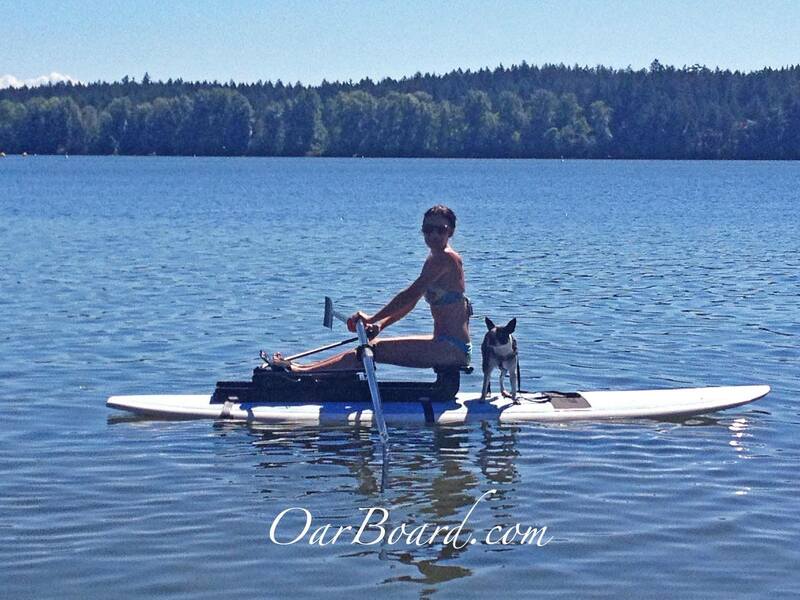 Do you have any great shots or stories about taking your pets on the Oar Board®? Let us know! You can contact us here.